Established in 1984, SETEDF is a non-profit Certified Development Company that promotes economic development within the community through the Small Business Administration SBA 504 Loan Program. We are regulated by the federal government and work with participating lenders (typically banks & credit unions) to provide capital in the form of long term loans to small businesses. The SBA 504 Loan program is a powerful economic development loan program that offers small businesses another avenue for business financing, while promoting business growth and job creation. The 504 Loan Program is designed to provide financing for the purchase of fixed assets such as real estate, and building acquisitions, as well as equipment and machinery, at below market rates. Interest rates are fixed for the term of the loan which can be 10, 20 or 25-year terms depending upon the project. SBA 504 loans can be a bit confusing. However, once you understand the loan structure you will easily see how the SBA 504 loan program is the ideal financing option for small businesses. 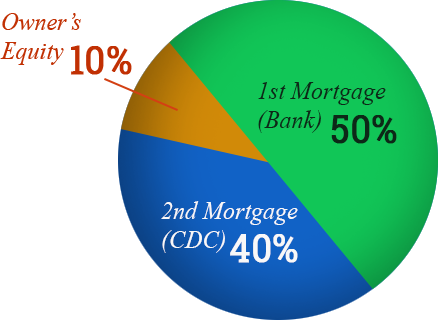 The typical financing structure for a SBA 504 loan is a 50-40-10 partnership. The third-party lender (bank or credit union) will finance 50% of the project; SETEDF/SBA finances 40% and; the borrower provides at least 10% equity injection. This structure makes it possible for small business owners to own commercial real estate with less money down. The long-term and fixed interest rate also allows the borrower to preserve cash flow for operations. * 15% equity requirement on special use properties or start up businesses; 20% for special use properties and start-up businesses. Machinery & equipment (if financed separate from real estate) = 10 years normally but eligible for 20 and 25 years depending on the life of the equipment. One of the primary purposes of the SBA 504 loan program is job creation. The SBA 504 loan must create or retain one job opportunity per the designated amount as specified by the SBA. Currently, the requirement is one job opportunity per $75,000.00 in project dollars that is being funded. For manufacturers, this amount increases to $120,000. A Job Opportunity is defined as jobs created or jobs retained because of the 504 Loan. Job opportunity requirements can be waived if a public policy goal is satisfied.